For many years, the mystery of what happened to monarch butterflies in winter was just that… a mystery! Back in the late 1950s a Canadian entomologist, Fred Urquhart, got the idea to put small tags on the wings of the monarchs he raised. He enlisted friends to help find the tagged insects. These helpers became early citizen scientists. Eventually it was discovered that monarchs flew to a few localized mountaintops in central Mexico. A program called Monarch Watch, based at University of Kansas, is continuing this research. 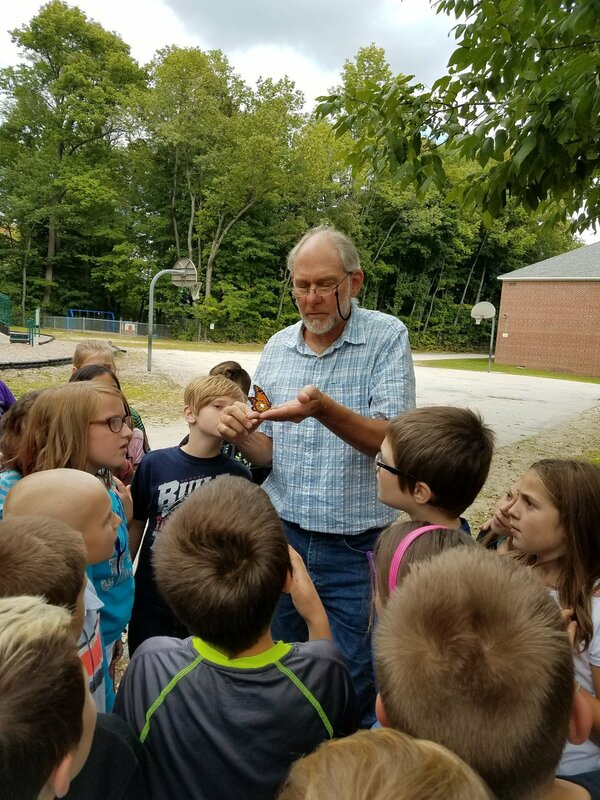 Mr. Chapman has been tagging monarch butterflies for Monarch Watch since 2000. Since then, he has tagged over 500 butterflies. Each small circular tag has contact information for Monarch Watch and a serial number. The adhesive tag is attached to the butterfly’s hind wing. So far this year, he has tagged fifty butterflies and there are many more to tag. In 2003, one butterfly that was tagged in Jaffrey was found in Mexico, a journey of over 2300 miles! In addition to helping scientists understand migration routes taken by the monarchs, tagging is also a way to keep track of population fluctuations. In the early 2000s, Mr. Chapman tagged around 50 butterflies per year, some years as many as 74. In the years between 2013 and 2016, the population dropped dramatically and only 7 butterflies were tagged. Fortunately the population is rebounding nicely this year. All this information can be used to help scientists determine the most effective practices to help ensure the survival of these fascinating creatures. Many JGS classrooms have net butterfly cages. Students or teachers find caterpillars and bring them into the classroom. Students have the opportunity to observe the caterpillars as they eat, grow, and transition into a chrysalis. As the butterflies emerge, classes joyously release them to begin their journey to Mexico. A highlight of the process is seeing Mr. Chapman apply the tag and hearing him describe Monarch Watch. 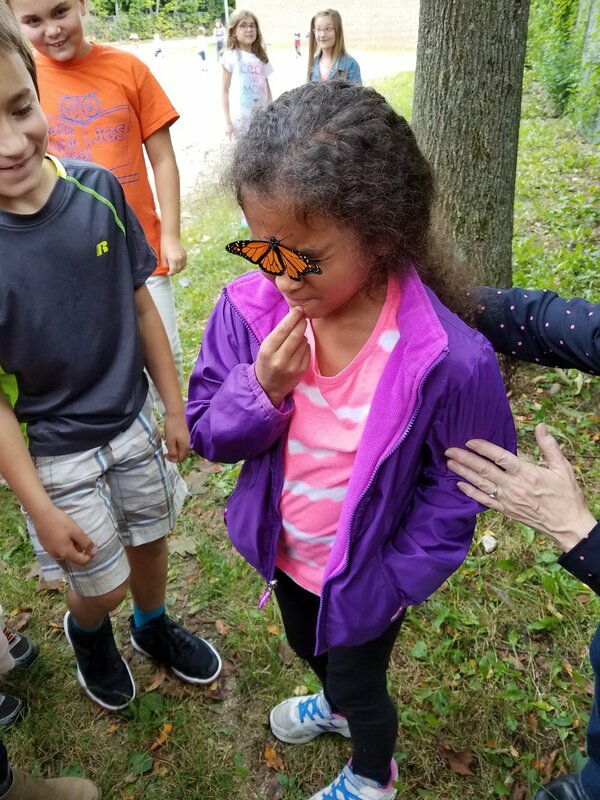 All the information learned through Monarch Watch is used by scientists to determine the most effective practices to ensure the survival of these fascinating creatures. Our own JGS budding entomologists are excited to be involved in this research! ARTICLE COURTESY OF JGS TEACHER ANDY CHAPMAN. REPRINTED FROM JGS NOTES.